Most waffle makers are electrically powered and many have high-tech features that allow you to set them up to cook automatically. Some even have LCD displays that you might expect to see on a handheld device. At the other end of the scale are cast iron waffle makers which cook waffles using the heat from a hot stovetop or a camp fire. If you want to try cooking waffles in the most traditional way possible our review of the best cast iron waffle makers will point you towards the best one. This is a stove top waffle iron which is as simple as they come. More importantly, it has excellent sized cooking plates to make thick and delicious Belgian waffles. 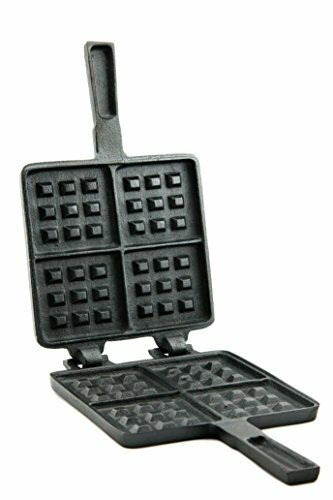 If you have been using an electric waffle then switching to a cast waffle maker might seem like a step backwards in terms of convenience, however there are many ways in which a cast iron waffle maker is even easier to use than an electric one, and the Nordic Ware Stove Top Waffle iron is a prime example of that. Although the cooking plates are non-stick it is always advisable to brush them with a little bit of vegetable oil to make doubly sure that your waffles will come away from the plates when they are ready. Prior to this, you should pre-heat each side of the waffle maker on a medium heat for a couple of minutes. Once you believe they are warm enough it is time to pour in your batter. One of the great things about this waffle iron is how deep the pockets are so don’t be afraid to make plenty of batter especially if you like thick Belgium type waffles. Pour in your batter at the center of the plate rather than trying to spread it around, because the batter will level out by itself. It may take a bit of trial and error to work out the correct amount of batter you need for set of waffles you are making. If you have too much it will leak out of the sides, and if you don’t have enough, you’ll end up with a round and incomplete waffle. Again, it’s all part of the fun, and eventually, you will judge the right amount of batter every time. About halfway through the cooking time, you need to turn the waffle maker over, and heat the other side. You can check by opening the pan to see how your waffles are progressing and once you believe they are browned the way you want them, then it is time to lift the pan from the stove and serve up. One the great advantages stovetop waffle makers have over electrical ones is they can be soaked in or washed down with water to get them clean right away. Once clean this Nordic Ware waffle maker is so thin when closed that it can be stored in most cupboards, and takes up the minimum of space. This is a cast iron waffle maker that is as basic and straightforward as it is as possible to be. It can be used on any stove top, and is also perfect for making waffles on a camp stove or if you really want to go 100% traditional, a campfire. Often when we review kitchen products some are so complicated we need to go into a lot of detail about the design, the styling, how to set them up, and all the technical aspects of how they are used. It must be said that the Useful UH-CI194 waffle maker is at the opposite end of the scale to that. To call this a cooking appliance is probably not accurate as there nothing to plug in, no switches and certainly nothing technical about it. It is basic cooking at its best and a throwback to the days when cooking any kind food took more than flicking a switch and waiting for the microwave to beep. 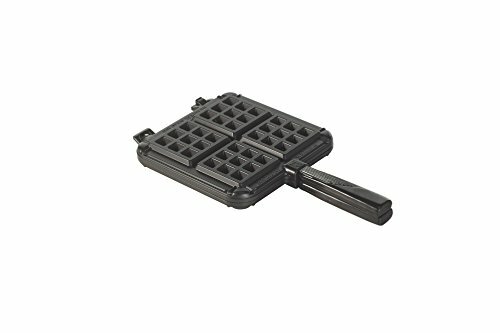 One of the best elements of this waffle makers is its deep plates which ensure that all the waffles you make in it are substantial which can’t be said for every waffle maker. The obvious benefit of thick waffles is they are more conducive to fillings so when you soak them in syrup or smother them in fruit and whipped cream they complement the waffle rather than drown it. Cooking your waffles is a simple case of brushing each plate with some oil or butter, heating each side for an equal length of time, and then pouring in your batter. Let your batter spread a little before closing the lid, although once the lid is closed the wide channeling in the cooking plates will allow the batter to spread further. You should turn the waffle maker over at least once although it will do no harm to turn it regularly if you ensure that each side is given an even amount of cooking time. Once your waffles are ready, serve them up, and add the topping that you, your family or your guests have chosen. To clean the waffle maker simply wash it in soapy water and if there is any piece of batter stuck to either of the plates a scrubbing brush can be used. New and improved! Interlocking hinges separate for quicker preheating and easier cleaning. Deep pockets capture your favorite toppings. Slim profile; takes up much less space than an electric iron. When reviewing more basic cooking utensils we use the word ‘traditional’ a lot, and if ever there was a cast iron waffle maker that term applied to it is this one. Designed for use on camping stoves, BBQ grills or open fires, this lets you cook waffles the way grandma did it. A first glance when the two halves of this waffle maker are apart, they look more like badminton racquets than something you’d use to cook waffles with. 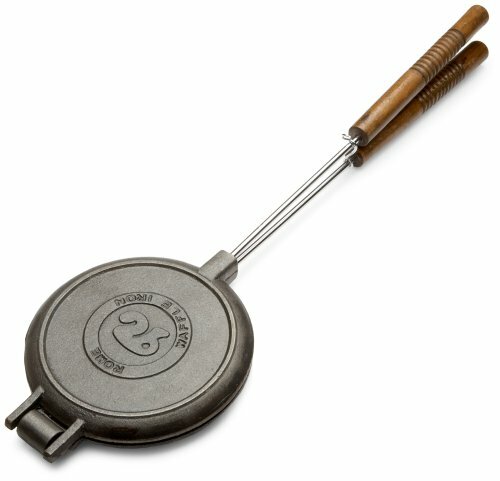 This is because unlike the other cast iron waffle makers we’ve looked at, this one has circular cooking plates, and very long handles. The main reason for the long handles is that this waffle maker is not designed for use on a stove top where you can safely get close to it. Instead, you heat this waffle maker using a camp stove or campfire. In both cases getting too close can be dangerous in terms of getting burnt. The longer handles allow you to turn the plates without having to get too near to the heat source. Another heat source that can be used is a BBQ grill. However, this would not be practical with the long handles still in place as they would most likely be in the way or get bumped, causing the waffle maker to fall off the grill. To eliminate this issue the handles can be unscrewed from the plates allowing you to handle them with your heat resistant BBQ gloves or tongs. We mentioned that the plates are circular, so the waffles they make will have rounded edges albeit they still cut into four quarters. The waffles also have the tried and tested lattice pattern, so you can fill them with everyone’s favorite fillings such as blueberries, strawberries, chocolate or simply smoother them in delicious honey or syrup. When it is time to clean up there’s no need for any fancy cleaning agents or detergents. As they are made from cast iron, the plates are tough enough to wash in the sink and stubborn, ground on waffle, can be removed with a scrubbing brush. Once clean, the waffle maker is so thin that it can be stored in even the smallest of spaces especially as the handles can be unscrewed to make it even smaller. We probably had the most fun testing and review these waffle makers than any others, and hopefully, you will too, no matter which one you choose. Despite them all being fun, only one can be the best cast iron waffle maker, and in our opinion, that is the Nordic Ware Stovetop Belgium Waffle iron. We found it the easiest one to prepare, the easiest to cook with and the easiest to clean and store. Given that beyond these four factors, there is not much more you can ask of a cast iron waffle maker, it was a straightforward choice. The fact it is also the cast iron waffle maker with the lowest price, confirmed it as our #1.